Many are the plans in a person's heart, but it is the Lord's purpose that prevails." (Proverbs 19:21). All right, then. Guess I can’t argue with that line of thinking. And yet, how often do I try? How often do you? It’s so hard to become comfortable in our own skin when we often press to be something other than what we are. But if we aren’t living as who God created us to be, then there’s a hole in the purpose he created us for. Yes, how we do things will look different than the person beside us--it's supposed to! Yet I find myself all too often creating plans in my heart of who I want to be based on those around me. Skinnier. Wittier. More vibrant. More chatty. More creative. Better received. Come on. I’m not alone here. Not in this day and age. Hmmm...those words made me think. 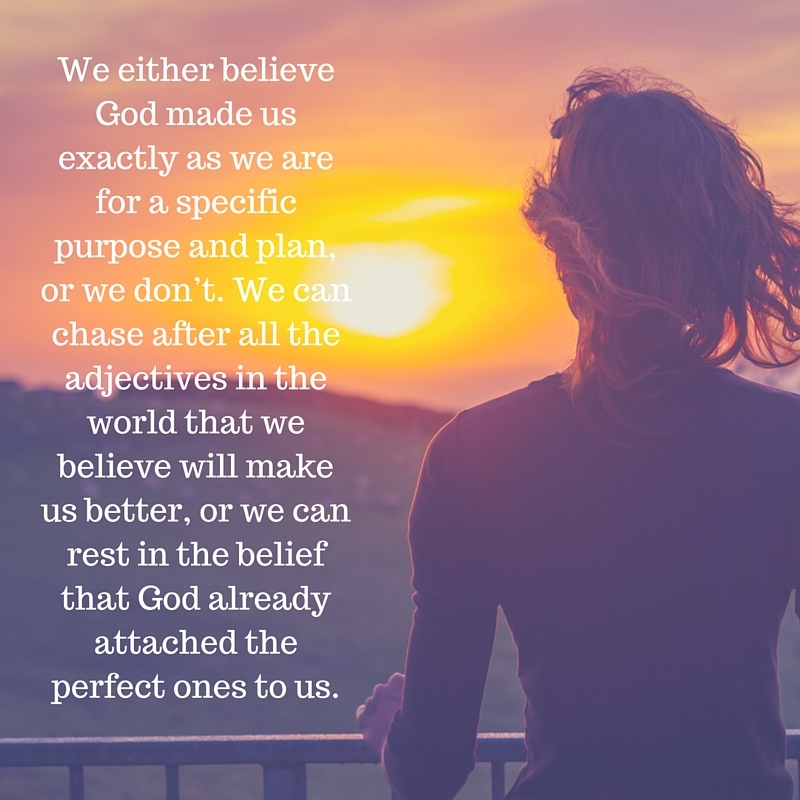 We either believe God made us exactly as we are for a specific purpose and plan, or we don’t. 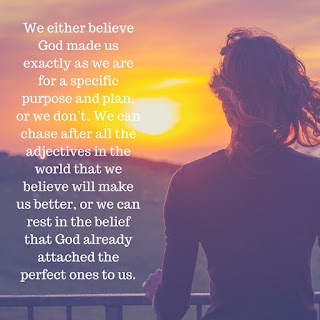 We can chase after all the adjectives in the world that we believe will make us better, or we can rest in the belief that God already attached the perfect ones to us. Oh, friend, does that mean we shouldn’t grow and change? Absolutely not! But our growth needs to be in chasing after His holiness and his plan for our life. We grow in him, not apart from him. And into who he created us to be--not who we think we want to be or need to be. Stop sizing yourself up only to decide you're lacking. Instead, press into him. Seek his desires for your life. Ask the plan-maker what the plan is, and let him be the one to say yes or no. Rather than becoming the women we want to be, let’s become the women God designed us to be. Truly, what could be better than that?